Now, I know that I’ve been doing the knee sweep a lot longer than I have been doing Nia. So it is true that Nia’s 52 moves are not necessarily unique to Nia, but they are part of the core of Nia. You will find a large portion of Nia’s 52 moves in every routine. There are correct ways to do them, but Nia allows for the body’s way and also, I believe Nia allows for the move to be incorporated into the dance. For instance, The Nia Technique book states that the starting position for a knee sweep is the sumo stance. I am sure that I have done a knee sweep from a sumo stance at one time, but the first dance that pops into my head where we do the knee sweep it is not from a sumo position. But the by the book (oh, yeah, that reminds me, “BUY THE BOOK!” 🙂 ), anyway, the by-the-book version of the knee sweep starts from a sumo position, complete with arms in ready position and everything. Then the body rises as you come up on one leg bringing the other leg up with a bent knee. The knee crosses the midline of the body, the opposite hand “pushes” the knee out. The knee swings out so the pelvis is open. Then the leg comes down and the foot lands on the earth. That is the knee sweep of Nia’s 52 moves. The book does not indicate that when your foot comes down it is in the toes-to-the-front position, but that is how I teach it. I don’t want my students landing on their foot with their knee out to the side. If we are just doing knee sweeps as an exercise, maybe I would have them do that, because they would be aware of the torque in their hip, but probably not. When I was first doing this move in Nia I was trying to do it as the book shows and as many of the people on the Nia instructional DVDs do and as the instructor does (whether it be Debbie Rosas or Carlos AyaRosas). And that was with the knee out to the side very wide. REALLY opening the pelvis. But when I did that I noticed a “something” – I don’t know what it was, but it was something – in my lower back. So I decided that opening my hip that wide and having my leg out that far was not MY body’s way, so I do not do that. I share with my students that I found the comfortable spot to be about as far as my forearms can reach. I “glue” my elbows to my sides and hold my forearms out to the side. As far as they can go is as far as I allow my knee to go. That is what works for me. Some of the time that we are doing the knee sweep it is at the end of a “up-two-three-four (knee sweep), back-two-three-four (knee sweep)”. So that would not allow for the sumo position to be the start. Other times we are standing upright. As I said, I am sure I have done it from the sumo position because I bet it is in a routine I am not thinking of. But the ones I am thinking of it is done from a walking or standing position. The amazing thing about the knee sweep is that it calls for the knee to cross the midline of the body. So that means that if you were doing a left knee sweep (with your left leg) your left knee would enter into the right hemisphere of your body. If you were doing a right knee sweep (with your right leg) your right knee would enter into the right hemisphere of your body. It is a great thing when your limbs cross the midline. It helps stimulate the brain. So there is a reason in many exercise routines and cardio classes that we have you do “cross overs”. The knee sweep is one of those moves that requires balance. Since at one point you are standing on one leg, you will be able to improve your balance or practice what you have. Also the moving of the leg helps with that stability. Standing on one leg helps with strength and opening the hip helps with mobility and flexibility. The knee sweep of Nia’s 52 moves does a body and brain good! Are you familiar with this move? Have you done it before in your exercise class? Did you give it a try? It has been over three years since I posted about foam rollers. 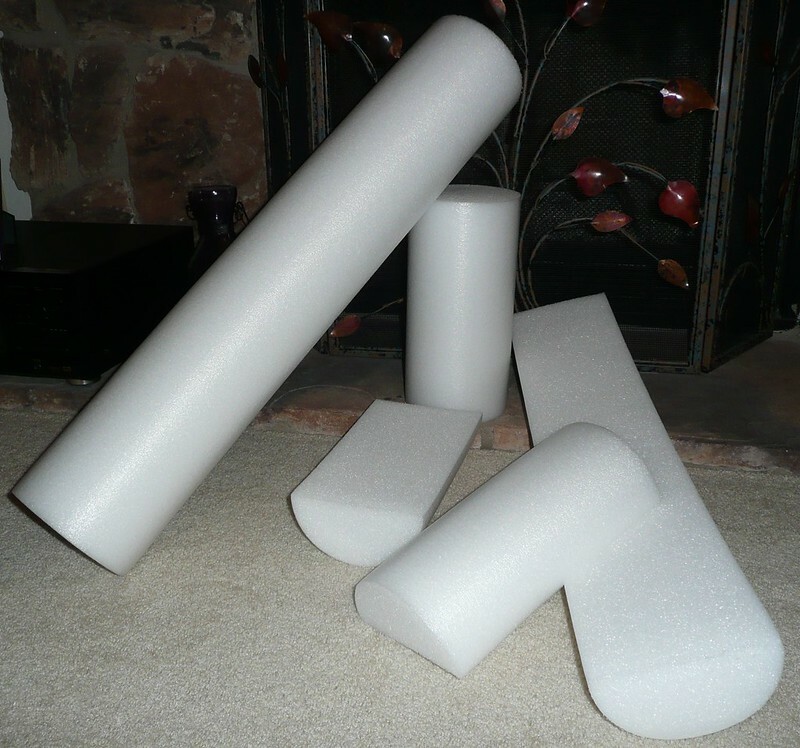 I know I post a lot about Nia because I teach it, but I am surprised I have not followed up with some additional posts about foam rollers. I think they might have become more common since my last post. I have seen them in gyms now, whereas I had not seen them there before. They have moved into mainstream exercise and are not just for the more therapeutic type of movements forms. It is nice to see them being used more frequently because they are a great piece of exercise equipment. They are affordable and portable. A great combination for exercise equipment. Typically they are 4 inches or 6 inches in diameter and they are 12 to 32 inches long. They are used in their whole form – round – or cut in half length wise. The different lengths are used for different things . . . obviously. So goes for the whole round or the half round. Since the foam roller is a great tool to use for people ranging from “new-to-exercise” to serious athletes it is nice to have a variety of them. The halved rollers can be used in the beginning of an exercise program to allow the body to be accustomed to standing on a rounded surface. The flat sides would be placed on the ground while you stand on the rounded sides. This could be used as a first step in a conditioning progression. Flipping the rollers over and using them on carpet could be used as the next step. The halved rollers flat side up on carpet. The carpet would help keep the rounded side of the rollers from being really slippery. Then the progression could be the halved rollers on a hard smooth surface. The smooth surface of the floor would provide the additional challenge. Next graduating to the long halved roller. You could start on carpet then once mastered move the roller to a smooth surface. Eventually moving on to the whole roller. That is just an example of how the foam rollers can be used for more than just stretching. Standing on foam rollers in the aforementioned progression would be a way to improve core strength and balance. And that was just a quick and easy example. There are many things that can be added to the information above to either make it easier or more difficult and/or to lengthen the progression. So foam rollers are not just for stretching and improving flexibility and mobility they can be used for improving strength, coordination, and balance. They are a great thing to add to an exercise program. There are a lot of different exercise you can do with them. I am not going to wait another three years to share some of them with you. I am going to be posting some in my next few posts. So stay tuned. Have you seen foam rollers in your gym? Have you seen people do exercises with them? Do you exercise with a foam roller?